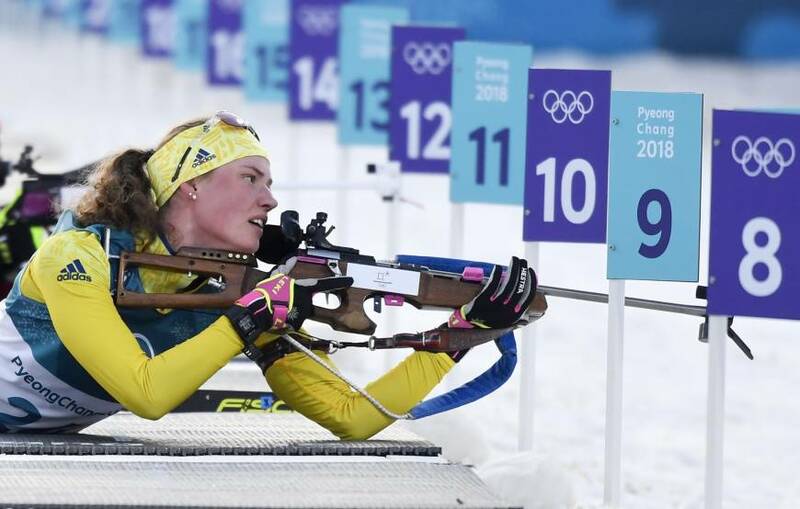 PYEONGCHANG, SOUTH KOREA - Sweden’s Hanna Oeberg made all 20 shots to pull off a shock victory in the women’s Olympic 15-km individual biathlon on Thursday, holding off Germany’s double Olympic champion Laura Dahlmeier, who had to settle for third after a costly early miss. Oeberg shot clean and skied brilliantly to finish in a time of 41 minutes, 7.2 seconds, which was 24.7 seconds ahead of Anastasiya Kuzmina of Slovakia who missed two shots but still managed to add another silver medal to the one she won in Monday’s pursuit race. 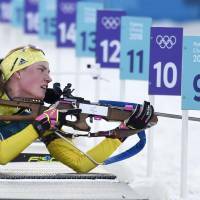 It was a stunning victory for the 22-year-old Swede, who was awarded the International Biathlon Union’s rookie of the year honour in 2017 and is ranked 58th in the World Cup standings. Dahlmeier looked invincible in Pyeongchang as she stormed to two gold medals, but an early miss in the first prone shooting cost her the chance of a third gold. The strong winds and biting cold of the early days of the Winter Games gave way to warmer temperatures as Oeberg and Kuzmina made the early running, and with each miss bringing a one-minute penalty, clean shooting was at a premium. Oeberg, who started 24th of the 90 athletes, shot clean and sprinted her last lap to take the lead ahead of Kuzmina, who missed twice but made up for it with fast work on the snow. With Dahlmeier out 80th of the 87 competitors, a teary Oeberg embraced her teammates as she endured a long wait to see if her superb performance would be good enough for gold. The 24-year-old German shot clean at the third shoot to reduce Oeberg’s lead to 32 seconds but she could not reduce the gap any further. Wolfgang Pichler, who coaches both Oeberg and men’s silver medallist Sebastian Samuelsson, told Reuters that Oeberg’s sensational win was the result of a gruelling training regimen that started last May. “We train hard,” Pichler said. “I cannot explain in just a few words, but it’s a system that I prepared in 1992 — there are many ways to Rome, but I know one way to Rome, and I follow it directly. Fuyuko Tachizaki, whose husband Mikito also competes in biathlon for Japan, was the top Japanese finisher. With seven misses, she recorded a time of 50:06.9, leaving her 76th among the 87 competitors who completed the event. Yurie Tanaka, Asuka Hachisuka and Sari Furuya, came in 80th, 81st and 85th, respectively. Also Thursday, Norway’s Johannes Thingnes Boe put in a blistering skiing performance to claim victory in the men’s 20-km individual biathlon event. The 24-year-old shrugged off poor form in his earlier events at the games to finish 5.5 seconds ahead of silver medalist Jakov Fak of Slovenia. Dominik Landertinger of Austria claimed the bronze.